Takeaway: When pipeline defects are detected, or pipeline failures occur, understanding the cause of these events is of utmost importance. Bacteria within pipelines attach to internal surfaces and grow as biofilms. The growth and maintenance of biofilms requires water, and even a low concentration of water in crude oil pipelines, or condensed water in gas pipelines, can be sufficient to allow patches of water-wet biofilms to grow. The preferred type of sample for microbiological testing is biofilms that can be obtained from weight-loss corrosion coupons that may be present in a pipeline, from sidestream devices that are specifically designed for the collection of biofilm samples, or from pigging solids/materials while cleaning pipelines. Accurate detection and quantification of corrosion associated microorganisms requires that samples be obtained and analyzed as quickly as possible when microbial growth tests are used. If samples are not analyzed promptly erroneous data may result. Also, the cleaning of pipelines, generally referred to as pigging a pipeline, produces a valuable source of samples for microbiological testing, but the heterogeneous nature of pig returns makes it challenging to collect representative data if not done properly. Another issue associated with pipelines is that MIC is not always considered when beginning an investigation of a pipe segment that is removed from service. It is not uncommon to have a pipe segment removed from service and sitting in a warehouse for days or even months before the possible involvement of MIC is considered. Microbial growth tests are the most common way to test for corrosion associated microorganisms in the oil and gas industry, but fresh samples are required. Once a biofilm has been exposed to oxygen and dried out, microbial growth tests can’t be performed, but genetic testing (quantitative polymerase chain reaction or qPCR) may still be an option, particularly if under-deposit corrosion and/or deep pits are present. 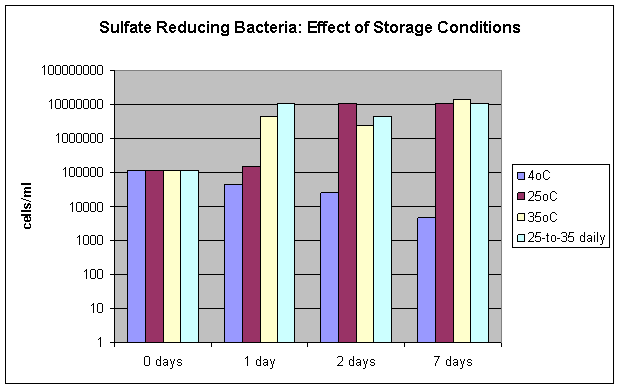 The effects of sample storage conditions on microbial growth tests is shown in Figure 2 where the results for the quantification of sulfate reducing bacteria (SRB) is presented with samples that were stored at various temperatures and then tested after 1, 2 and 7 days. SRB are a particularly important group of microorganisms because they convert sulfate into highly corrosive hydrogen sulfide. Significant changes in the quantification of microorganisms can result from storage conditions if a sample is not analyzed immediately. Storage of microbiological samples on ice (4°C) yields the best results, but storage at 4°C for only 1 day can result in underestimates of the true microbial population (results may be only 10% of the true concentration). Storage of samples at higher temperatures can result in values that are 100 times higher than the results obtained with fresh samples. Figure 2: Effect of storage conditions on the accurate quantification of sulfate reducing bacteria. 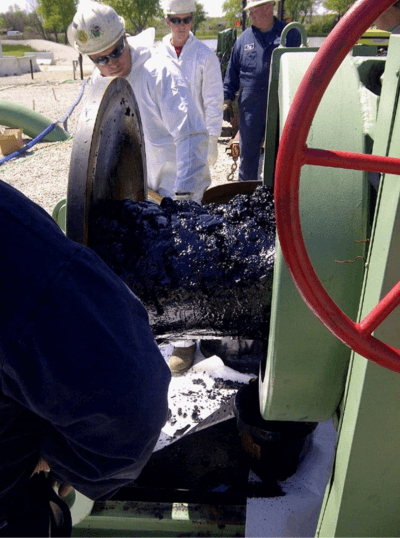 Obtaining biofilm samples from pipelines can be challenging but possible sources include weight-loss corrosion coupons, sidestream devices, and pigging returns. An example of a weight-loss corrosion monitoring coupon is shown in Figure 3. Biofilms can be collected from these coupons using a sterile cotton swab. This procedure takes less than a minute and doesn’t interfere with the collection of weight-loss data for calculating corrosion rates. Sidestream devices are sometimes installed in pipelines, particularly water pipelines, to specifically provide sampling locations for biofilms that can be used in microbiological testing. An example of a sidestream device is shown in Figure 4. However, it frequently occurs that neither weight-loss coupons nor sidestream devices are available for a given pipeline. In that event the only source of biofilm samples can be pigging solids resulting from pipeline cleaning. 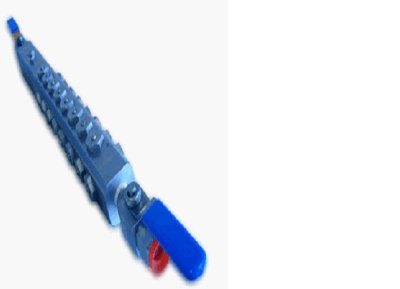 The solids obtained from a pipeline pigging operation are very heterogeneous. 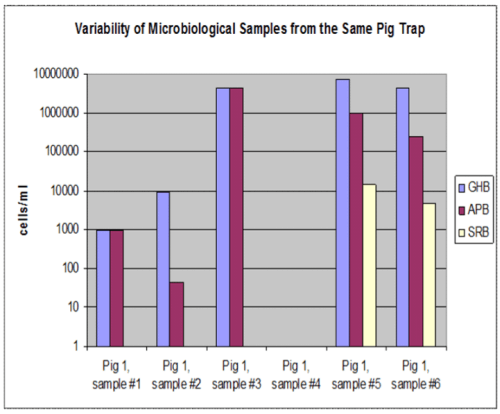 The data graphed in Figure 5 were derived from six different samples from the pig returns shown in Figure 6. All the solids obtained from pigging this crude oil pipeline were oil-coated and looked the same, yet Figure 5 illustrates that some samples contained microorganisms while others don’t. While the amount and the appearance of the solids recovered from pigging of various oil, water, and gas pipelines is different, pigging solids from all these sources show similarly variability in microbiological testing. The recommended protocol for the sampling of pig returns involves the collection of a minimum of two composited samples from the pigging solids and from three different locations on the body of the pigging tool. These two composited samples can then be used to inoculate microbial growth tests, perform testing to quantify adenosine triphosphate (ATP), and/or to perform genetic testing. Obtaining composited samples increases the likelihood that any microorganisms present will be detected, but data interpretation is also important. 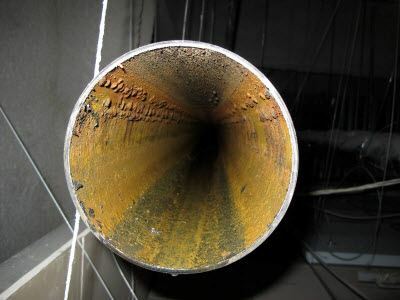 Biofilms grow attached to pipe surfaces, but they do not generally coat all pipe surfaces uniformly. Rather, biofilms may be present in only certain locations that correspond to scratches in the pipe surface, areas of sediment accumulations, or at seemingly random locations. Accordingly, the biofilms present in pig returns may be derived from a relatively few locations so microbial concentrations detected in composited samples underestimate the actual concentration of microbial cells in biofilms attached to pipe surfaces. For this reason, even moderate concentrations of corrosion associated bacteria detected in pigging solids can indicate a potentially high risk of MIC at specific locations within pipelines. If pipe segments have been removed from service and fresh microbiological samples were not taken at that time, then microbial growth tests can’t be performed. However, genetic testing may still be able to detect DNA from corrosion associated microorganisms because genetic testing can detect DNA from both living and dead bacteria. DNA from dead bacteria will eventually degrade and become undetectable, so an interesting question is how long can a pipe segment be removed from service and still yield useful samples for genetic testing. The pipe segment pictured below in Figure 7 had been removed from service and sat under atmospheric conditions for several months prior to testing. 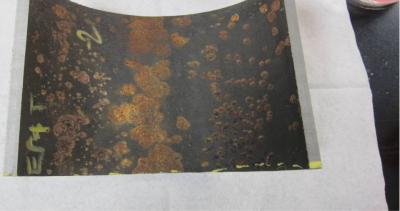 Possible biofilm swab samples from the pipe segment were collected, both from an area that did not have obvious corrosion as well as from corroded areas. Every effort was taken to obtain material from underneath corrosion products, as this offers the greatest chance of recovering intact DNA if bacterial cells were present. These samples were analyzed to quantify bacteria using genetic qPCR tests to quantify total bacteria, sulfate reducing bacteria, nitrate reducing bacteria, and archaeabacteria (methanogens and thermophiles). No DNA or bacteria of any kind was detected in any of the samples at concentrations above the detection limit of the assay. 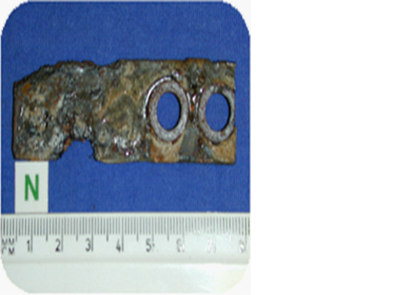 Dry pipe segments that have been out of service for weeks or months prior to sampling generally do not yield detectable DNA unless the sample is obtained from a deep pit protected by corrosion deposits as shown in Figure 8. Genetic tests showed that about 106 cells/cm2 of total bacteria were present in the sample obtained from the pit shown in Figure 8 as well as about 104 cells/ml sulfate reducing bacteria. The deep undercut pitting in this pipe segment probably provided protection of the bacteria's DNA in this sample. DNA was recovered from the pit in this dried pipe segment. Microbiological testing is an important component in pipeline monitoring and maintenance programs. (Learn more about monitoring in Case Study: Offshore Platform Implements Faster, Safer Corrosion Monitoring Tools.) However, care must be taken to analyze samples as quickly as possible when microbial growth tests are performed, and collecting multiple composited samples is recommended when heterogeneous material such as pig returns are being sampled. Genetic tests can detect DNA even from dead bacteria and can be used to test for the presence of corrosion associated microorganisms on samples where microbial growth tests can’t be used, such as old pipe segments. However, DNA degrades in the environment and even genetic testing may be ineffective if pipe samples have been removed from service for more than a month. 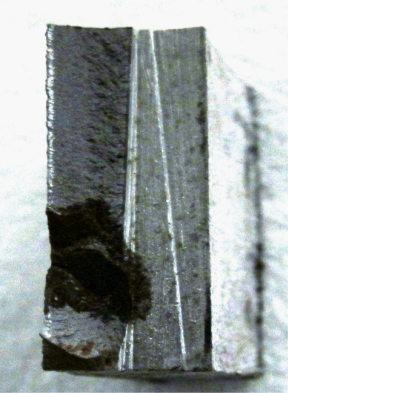 It is important to obtain comprehensive data to determine the corrosion mechanism in any given sample. Physical and chemical tests, as well as microbiological and genetic tests should all be used. Microscopic examination of the morphology of corrosion pits, chemical analysis of corrosion products, metallurgical analyses, microbiological analyses, and knowledge of the operating conditions and fluid composition when the pipe was in service should all be considered when making a determination regarding the likely corrosion mechanism.